Last weekend was a blast! Jodie's whole family came to stay with us. Yessir, in our 1,100 square foot Taj Mahal, Jodie's parents (Dave and Judy) and sister (Leslie) slept in comfort along with Jodie, me, Millie, and Oz. It was cozy and really, really fun. But this is a flying blog, and yes, there was flying involved. Even before Jodie was ready to fly with me, her mom had asserted a strong vote of confidence in my ability and responsibility. Still, I was not quite sure if she or others in the family would ever really want to go into the air in our Tiger. They wondered about the safety and fun of it, and I didn't want to pressure them. I decided not to ask, but instead just to wait until they suggested it. But when I arrived home from Detroit late on Thursday night, Leslie was there and I couldn't help it - I asked her if she wanted to go flying on Friday. After a few nervous glances at Jodie, she said yes. So I spent Friday morning in the office while Jodie and Leslie frolicked in Frederick. Heading to the airport in the mid-afternoon, I blasted off for the 10-minute flight to the Frederick airport. I landed and cleaned the windows while waiting, then escorted Leslie to the plane while Jodie took off in the car to meet her arriving parents. 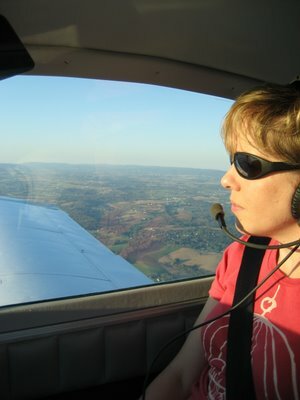 It was a beautiful day and perfect for a short intro flight. 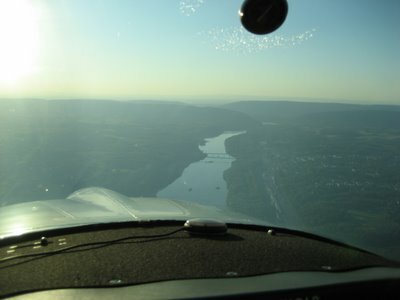 We flew southwest to intersect the Potomac River, then followed it northwest to Harper's Ferry. I played my "Flying" playlist through our headsets as we banked and turned to follow the bends in the river. Passing Harper's Ferry, I circled north and back toward Frederick. We climbed to 3,500 feet and flew a steep circle while waiting for Air Traffic Control, then dove under the Class B airspace to return to Gaithersburg. I lucked out with a good landing, and we pushed the canopy back as we taxied in. It was a good flight. The rest of the weekend was filled with sunshine, good food, and good company. 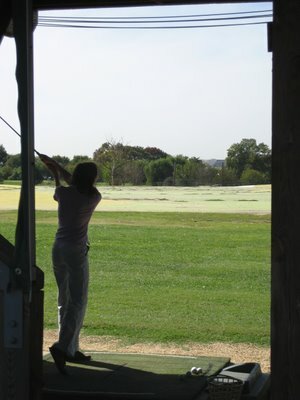 Jodie went to a golf lesson while Leslie and their parents and I walked around Haines Point. 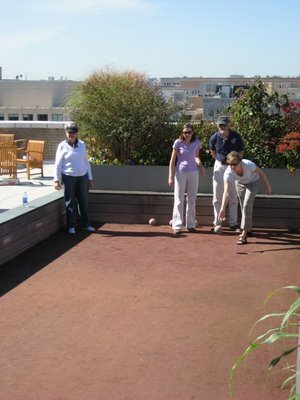 We got coffee from Starbucks and played bocce on the roof, just like any average workday at my firm. Leslie flew home (by airline) on Sunday, then Jodie and her parents and I headed to the airport. "Chesapeake Bay or Blue Ridge Mountains," I asked. Judy answered that she'd love to see the water, so Dave, Judy, and I took off from Gaithersburg and headed east through the corridor. As we approached Annapolis, I veered north and flew over the Naval Academy, then paralleled the Bay Bridge across the water. Dave remembered that Jodie and I had almost gotten married at Kent Manor on Kent Island, so I angled our course south to overfly the Manor grounds. 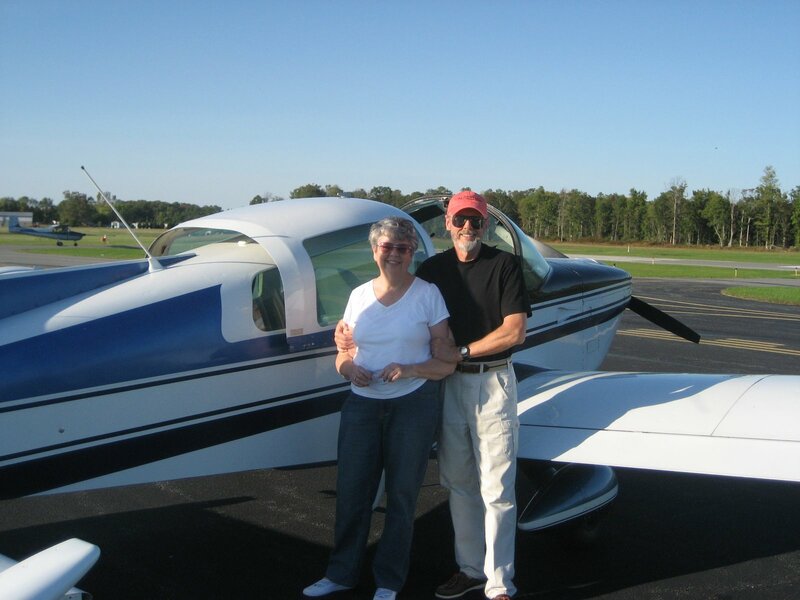 Continuing southeast, we circled and landed at Cambridge so Dave and Judy could switch seats, then we took off again to head home. It was a perfect day for the flight, and there was hardly a bump during the whole trip. Judy took the controls for a bit on the flight back and kept us generally on course while I fiddled with the map. Back through the corridor from the bay, we entered the traffic pattern and turned final to land. A student pilot misjudged our distance and pulled onto the runway, requiring us to go around and driving my blood pressure up a little, but we just circled around and landed as Jodie ran to meet us. It was a great weekend and a successful flying weekend, if only because I added three more names to my passenger list. It was a pleasure to share our plane and excitement with each of them, and I hope the memory brings a smile for a while.